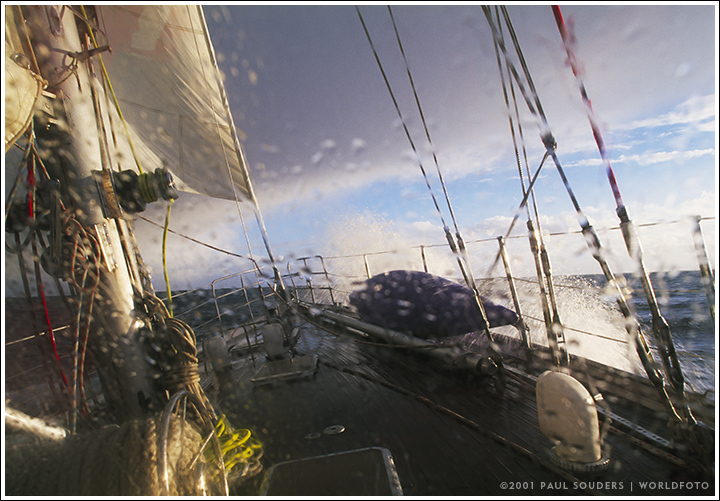 At the start of an Antarctic expedition, the sailing yacht Sarah Vorwerk heels over in a squall south of Cape Horn. As if on cue, a squall blew in hard and fast, and upon leaving the last protection of land, we took it right in the chops. Forty knot winds whirled the sea into ugly chaos. Photographed January 6, 2001 using a Canon EOS-1 camera and 24mm f/3.5 Tilt-Shift Lens on Fujichrome Velvia slide film. This entry was posted on Saturday, January 6th, 2001 at 8:41 am. It is filed under On the Road and tagged with Antarctica, Expedition, Oceans, Sailing, Travel. You can follow any responses to this entry through the RSS 2.0 feed.